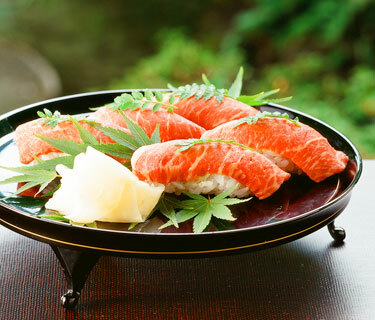 "Sushi," a characteristically healthy Japanese specialty, is becoming a worldwide craze. Although sushi is usually made from seafood, with the use of Shimane Wagyu Beef, with its savory flavor of fat and creamy and tender texture, you can produce a most flavorsome sushi that is reminiscent of fatty tuna. 1) Cook rice with kombu and water, add sushi vinegar (mixture of vinegar, sugar and salt) to the cooked rice and mix. 3) Take a handful of (1) and (2) to manually shape into sushi form. 4) Place the sushi on a dish, place kinome on top and serve with pickled ginger. Shimane Wagyu Beef is valued highly in Japan, as seen in the high praise it receives without fail at the National Competitive Exhibition of Wagyu（全国和牛能力共進会）, a competition that has been held eight times in the past, in which it has twice one the Prime Minister’s Award（内閣総理大臣賞）. The beef has a bright color and fine marbling, and has a rich flavor and zestful taste. Slice the beef diagonally into thin strips suitable for manual shaping into sushi by pulling the knife towards you. Place the slice of beef in your left hand and apply some grated wasabi. Gently roll a ball of sushi rice with your right hand and place it on the beef. Flip it upside-down on your left hand and adjust the shape by pressing your two right fingers over the beef. Gently wrap both sides of the sushi with your left hand and press the top with two right-hand fingers to make the shape. Be careful not to squeeze the sushi too hard. Kinome is a young leaf bud that grows on the Japanese pepper tree. With its vivid green color, it is used frequently to add a colorful touch to Japanese cuisine. It is said that its scent gets stronger when slapped on your palm prior to use.